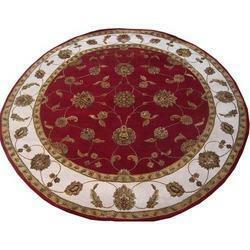 Leading Manufacturer of round rugs from Jaipur. Our organization is involved in manufacturing, supplying and trading an exquisite range of Round Rugs. The collection of these round rugs is highly durable and attractive rugs are the result of hard work of the craftsmen and have huge demand in the international markets. Optimum-grade fabrics and quality-approved yarn materials are used for designing these round rugs. In addition to this, our offered round rungs are checked on various stages by our quality controllers assuring its flawlessness.